Make good grades, make your parents proud, and don’t make a complete fool of yourself! Confession #1- I almost didn’t apply. Let’s start with the application. I was quite involved in undergrad. Which, ironically, is the very reason I almost didn’t apply. I was surrounded by greatness everyday. I sat in meetings with SGA Presidents, Greek Life Presidents, and record-breaking varsity athletes. I attended philanthropic events with Rhodes Scholars, Fulbright Scholars, and budding social entrepreneurs. I knew their accomplishments, I knew their stories, and I felt mine paled in comparison. 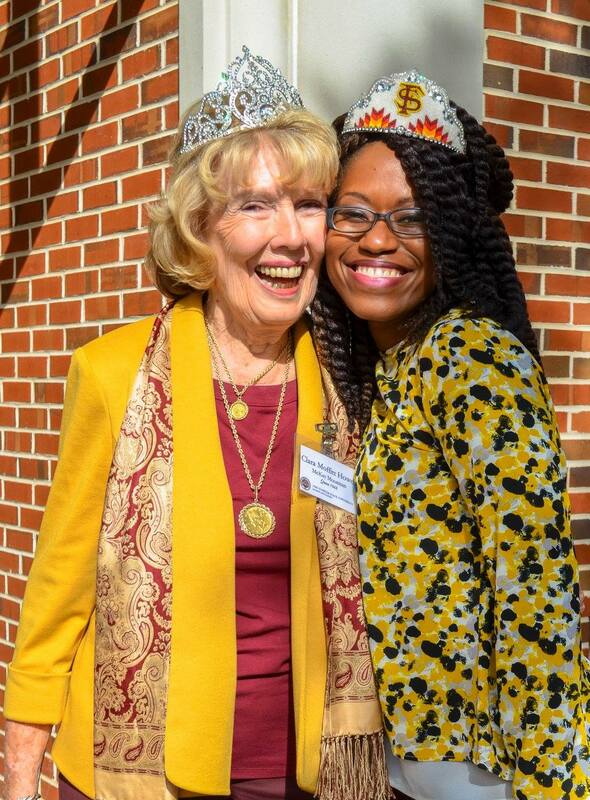 But then, I remembered how awesome it was to be a freshman, a sophomore, and a junior at FSU, and see the diversity of the Homecoming Court. Every year, different colors and corners of campus came together, and we celebrated them all. This geeky little Black girl poured out her heart in essay responses of 500 words or less, rushed over to the Alumni Center, and hand-delivered her application with just minutes to spare. Homecoming 2008: Pictured with Chief Dorian George at Pow Wow, ready to pass on our crowns. Confession #2- I cried after my interview. In my era, every applicant signed up for an interview. Because I submitted my application after everyone else, I had slim pickings. Either be first, or be last. I prayed really quickly and signed up for the final slot on the final day. “More time to get my life together,” I thought. WRONG! It was actually more time to completely freak myself out! I am excellent at motivating others. I can energize just about anyone. But when it comes to motivating myself? The negative, judgemental voices in my head are just way too loud. For the next 20 minutes, I let them see the true me, and all of my geeky glory. When it was over, I stood up, shook everyone’s hand once again, and scurried to my car. I backed out of the lot, only to head a few blocks down the road before pulling over. I had no idea if the celebrities on the committee would select me to serve on the court. However, I was just so proud of myself for showing up that I sat in the car and boo-hoo, snot-faced cried. 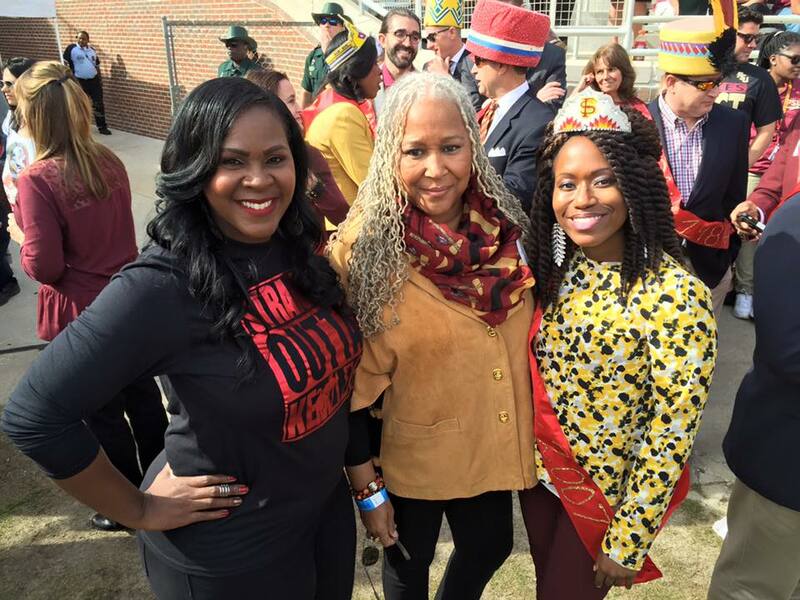 Homecoming 2015: Pictured at half-time with with 2000 Princess Rennai Palmer-Kelly (left) and FSU’s first Black Homecoming Queen Doby Flowers, 1970 (middle). Behind us are other Chiefs & Princesses as we prepare to take the field for our Royalty Reunion presentation. Fun note: I love this pic, because Mrs. Palmer-Kelly and Ms. Flowers are both my sorority sisters. Confession #3- I borrowed everything but my underwear. Everyone on the court attended a briefing a few weeks before Homecoming. We were corralled into that same conference room with the stately wooden table. We went over events, attire, behavior, and other important items. I scanned our itinerary, and I nearly passed out. “You’ve got to be kidding me!” I thought. (Déjà vu much)? The entire court was scheduled to be at seven events throughout the week. (That’s not the problem. Keep reading). Two of these events required cocktail dresses, and two other events required formal attire. Where was I supposed to get the money for this??! I mean, I could scrape together some funds from my job at Leach (I had to get rid of that 6 am shift though, real talk) to pay for hair, nails, and gas. But that’s it! I couldn’t afford anything else. I owned not one garment that would make me feel confident while standing next to the other elegant ladies on the court. A number of these ladies were well-versed in pageant life, formal socials, and the general act of gussying up! I felt like a caterpillar among butterflies. I felt like I didn’t belong. A few days before the big week, a close friend checked in with me to see how I was doing. To this day, I consider her a godsend. I hadn’t really told anyone how stressed I was, because I thought it would be selfish and ungrateful of me to do so. However, she took matters into her own hands. Before I knew it, I had two cocktail dresses from two sorority sisters, shoes and accessories from another sorority sister, a makeup appointment for game day courtesy of a fourth sorority sister, and two beautiful gold (school colors for the win!) formal dresses from my angel of a friend. These ladies helped me feel elegant, confident, and excited to represent. I basically borrowed everything except my underwear. 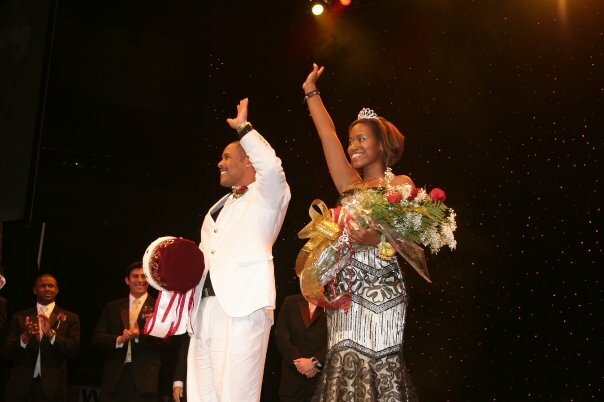 Homecoming 2007: Pictured at Pow Wow with Chief Dorian George as I was being crowned. (I think I asked him if this was for real, lol). October 26, 2007. Confession #4- I never heard them call my name. “Don’t trip walking up the stairs. Don’t trip walking towards center stage. Pause and smile. Don’t trip walking towards your marker at stage right…or is it stage left? Well, whatever you do, DON’T TRIP!” This is all I could think of as the Homecoming Court prepared to be presented one last time before the 2007 Chief and Princess would be announced. Thousands of faculty/staff, students, FSU alumni, and fans gathered in the civic center to see stunts performed by the Flying High Circus, hear selections from the Marching Chiefs, see student organizations display their talents, and laugh their stomachs sore with this year’s headlining comedian. (Sarah Silverman, in case you were wondering). I, on the other hand, was waiting at the foot of the stairs, praying that I didn’t trip! On cue, the entire court exited the wings and filed onto stage. As the announcer started reading our bios, my mind drifted to some advice a mentor had given me for this very moment. I looked over the crowd as I took in the last 3.5 years. I saw the time I thought my life was over, because I wasn’t accepted into the athletic training program. I saw the semester when I failed Organic Chemistry and was too terrified to tell my parents. I saw the times when I felt too Black for my White friends and too White for my Black friends. And the times I cried in my mentor’s office, because I felt so pressured to prove my worth. I saw flashes of late night counseling sessions in parked cars; complete breakdowns over boys I liked that didn’t like me back; and hours of over-analyzing what outfit I should wear to Union Wednesday. When I peered into the faces of the crowd, I saw the winding paths of diverse journeys that all shared one common goal: don’t make a complete fool of yourself! We can pretend it’s much deeper than that, but really, all of us are just sincerely hoping that we don’t screw up too badly while trying to figure out how to “make it” in this thing called life. Well, I obviously paused too long to process these memories, because I missed it when they called my name! In fact, I never heard it at all! 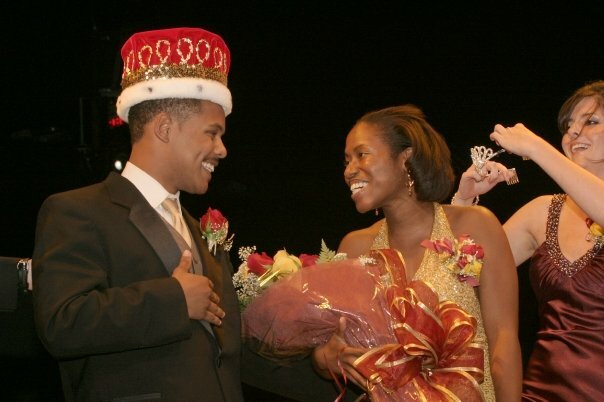 I only gathered that I had won once my good friend and Homecoming Chief (love you, Dorian!!) gave me the big eyes and a few covert gestures, beckoning me to step forward. In that moment, I forgot about trying not to be weird, awkward, or foolish. I was content with just being me. It was one of the most freeing and fulfilling moments of my life. Confession #5- It literally changed my life. So, did I make good grades? Mostly. Did I make my parents proud? Certainly. Did I avoid making a fool of myself? Absolutely not. And that’s ok. Instead, I learned how to celebrate who I was, who I am, and who I am becoming. I learned to be cautious of losing myself in what people want or expect me to be. I learned to borrow from the love and support of friends, when I feel out of place or unworthy. I learned to embrace myself as I am in this moment, cocoon and all, for soon, I would surely fly. It’s been ten years since that transformational experience occurred, and I’m so glad that it did. It changed my narrative from that of, “It’s possible,” to one of, “I know, because it happened to me.” I share my story to encourage folks of all colors and corners of our community that, despite your flub-ups and meltdowns, you are enough. You may be full of failures and triumphs. You may be fearful, yet bold. You may be insecure. You may be totally awkward. But, just like everyone else in this room–in this world–you are a human being. So be real, be you, and let’s represent together! 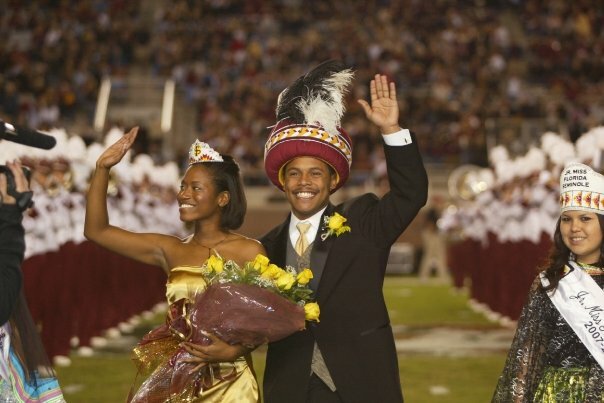 Homecoming 2007: Pictured with Chief Dorian George during the half-time presentation. October 27, 2007. Dr. Asha is a Creator of Healthy Conversations. 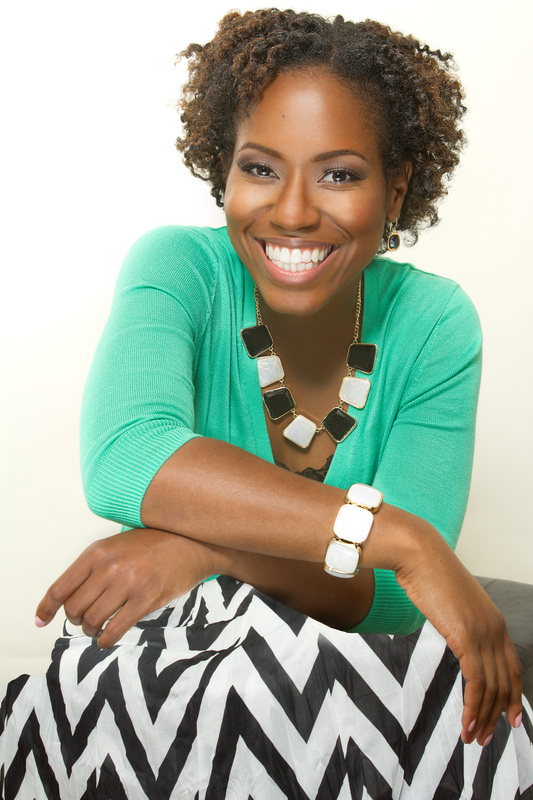 Through empowering written and spoken messages, she inspires the busy and overwhelmed to live life abundantly. Join the conversation by booking Dr. Asha for your next engagement. I love this and I love you! Your dates under your pictures say 2017. Are they supposed to say *2007?